It's easy to overlook the noew deleted K1200S if you're after a hyper-tourer along the lines of a Hayabusa or ZZR1400 - but it's your loss if you do. The big K is as soberly classy and breathtakingly effective as ever and is durable and well-equipped if you go for a loaded-up version. Best of all, though, the 1200 is something of a steal compared to the later 1300 version. 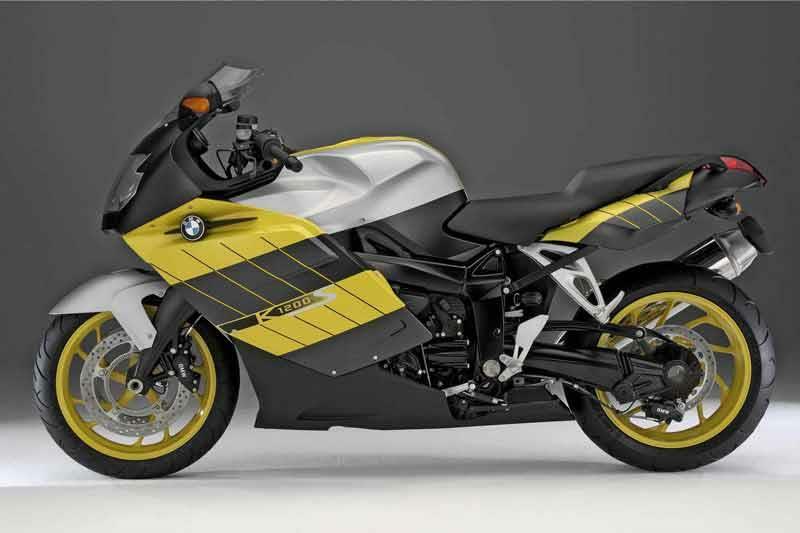 Never one to shy away from innovation, the BMW K1200S uses another new system for front suspension. A single shock does the work which linkages transfer the forces. 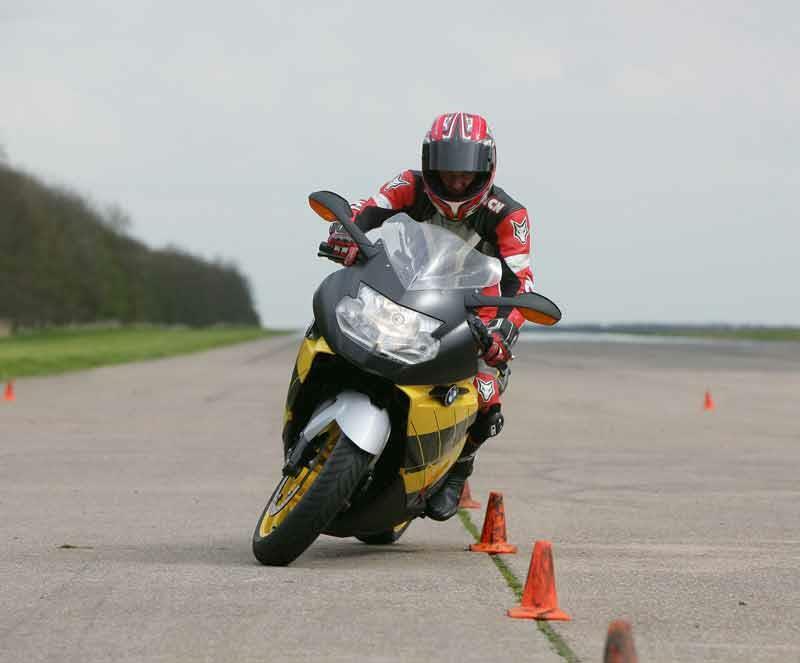 The theory is it separates braking and cornering forces – which is does. It’s brilliant everywhere except a racetrack and the motorcycle is still acceptable there. 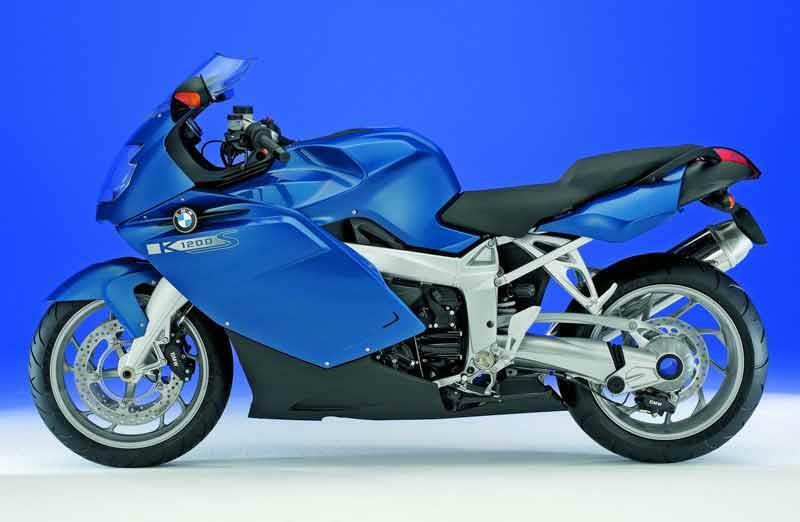 After decades of obstinance, the BMW K1200S has BMW’s first across-the-frame four motorcycle engine – the layout the Japanese motorcycle manufacturers have used to dominate motorcycling. And it works. 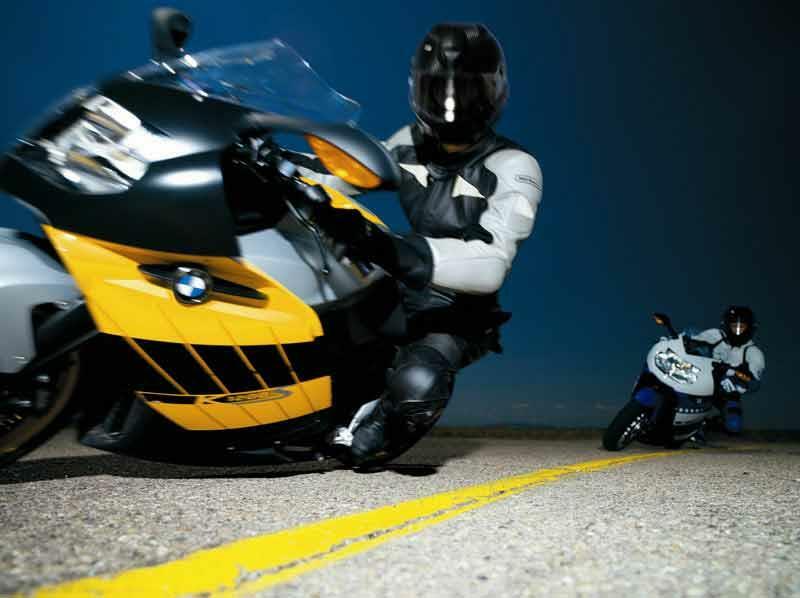 Low down torque is plentiful, midrange and top end power are excessive in the BMW K1200S. 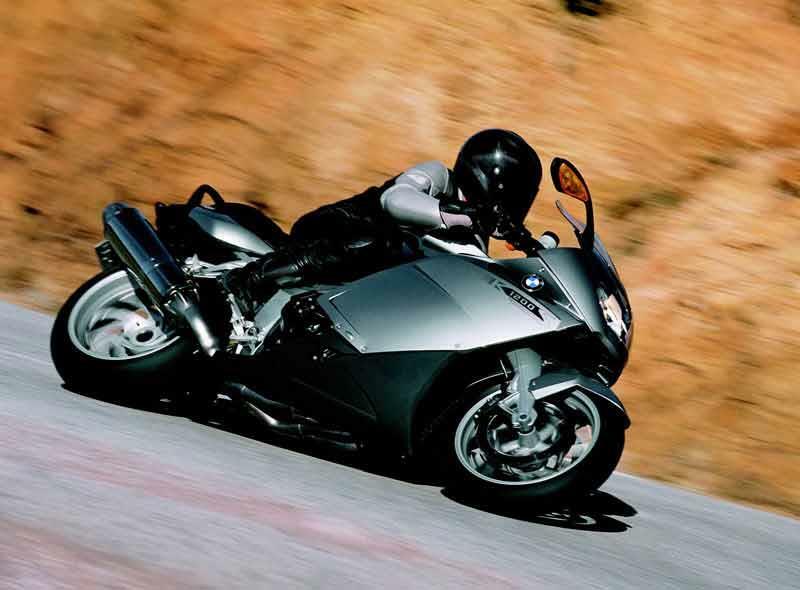 You’ll need an autobahn and big balls to get the BMW K1200S' throttle on the stop. The motorcycle's gearbox is awkward when hot. Few motorcycles shrug off winter better than a BMW motorcycle. That said a BMW K1200S will still need regular attention to keep it looking shiny. Shaft drive means less maintenance and expense. A few used motorcycles seemed to have suffered from vibration and quite high oil consumption. Thoughtful ownership of the BMW K1200S and to-the-book servicing may prevent this. 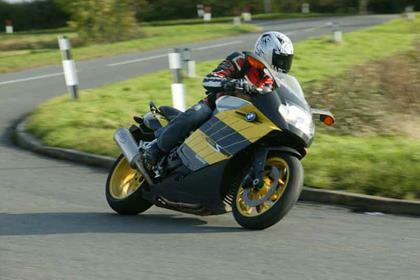 BMW K1200Ss can be had for very little money nowadays, and are much cheaper than the K1300S. 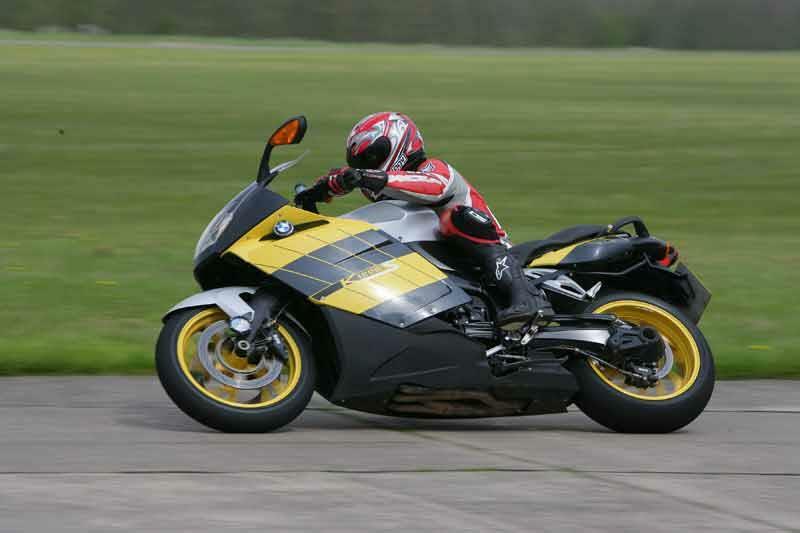 You can find good K1200Ss in private hands for almost as little as £3000 if you look hard enough. 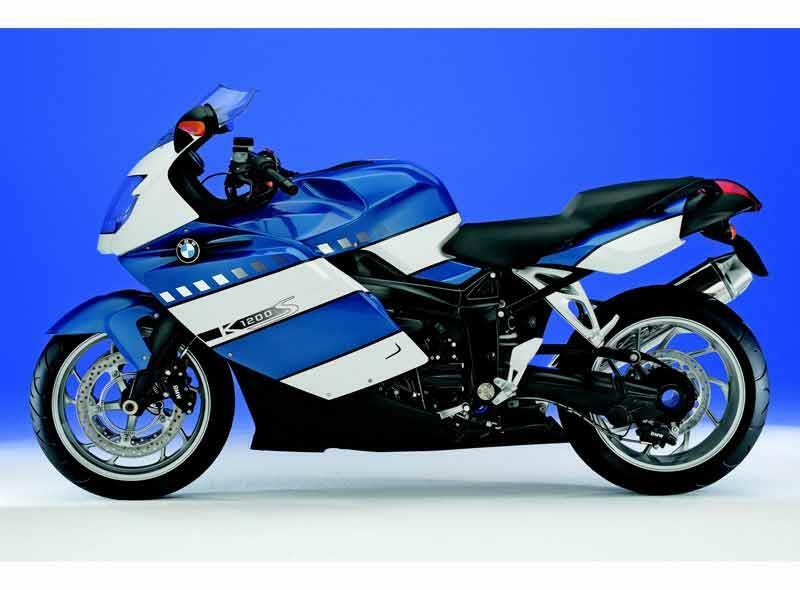 Find a BMW K1200S for sale. The BMW K1200S' comfort is better than many touring motorcycles and the electric screen is superb at making autobahn wasting totally relaxing. BMW’s panniers are quite small but don’t affect high speed handing like some larger aftermarket ones. 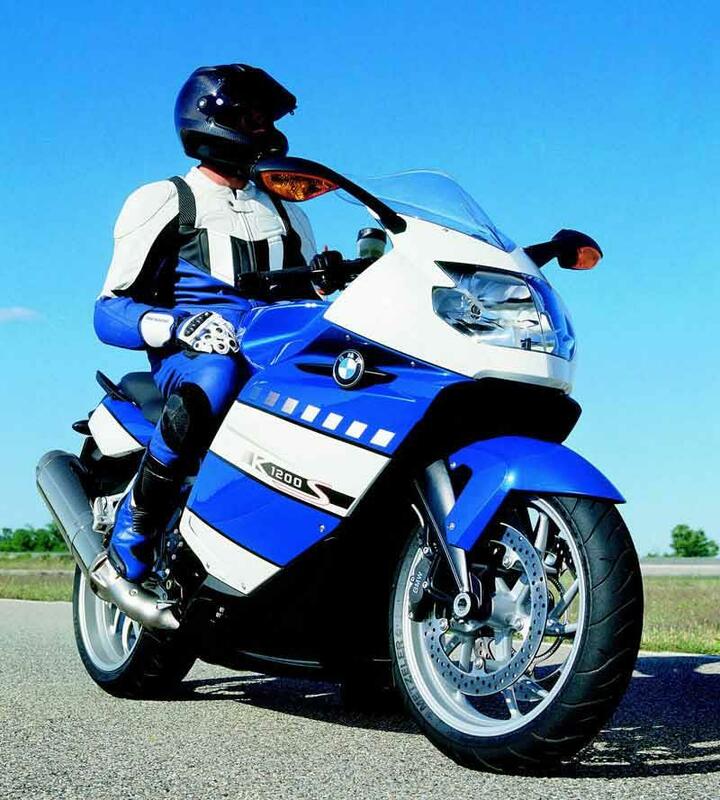 Factory extras for the BMW K1200S include the excellent Electronic Suspension Adjustment (ESA), low seat, heated grips, on-board computer and an alarm. 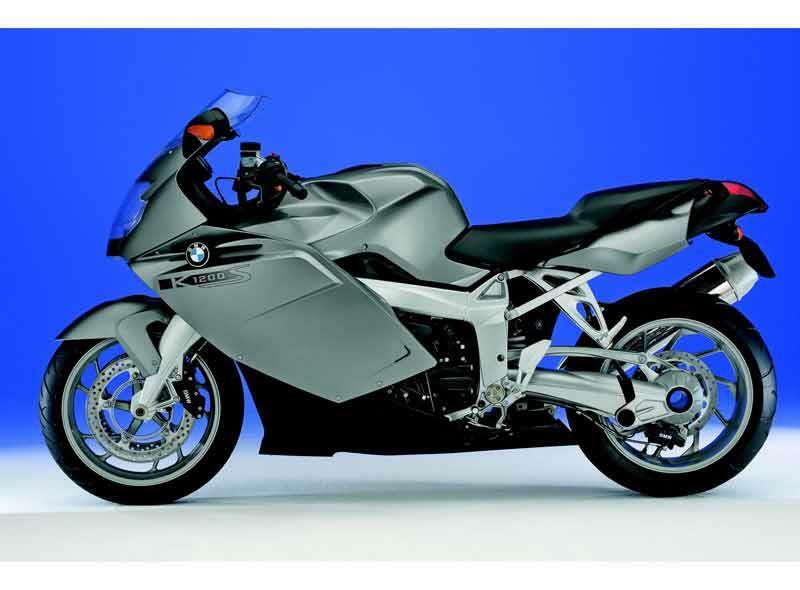 2004: Original BMW K1200S motorcycle launched. 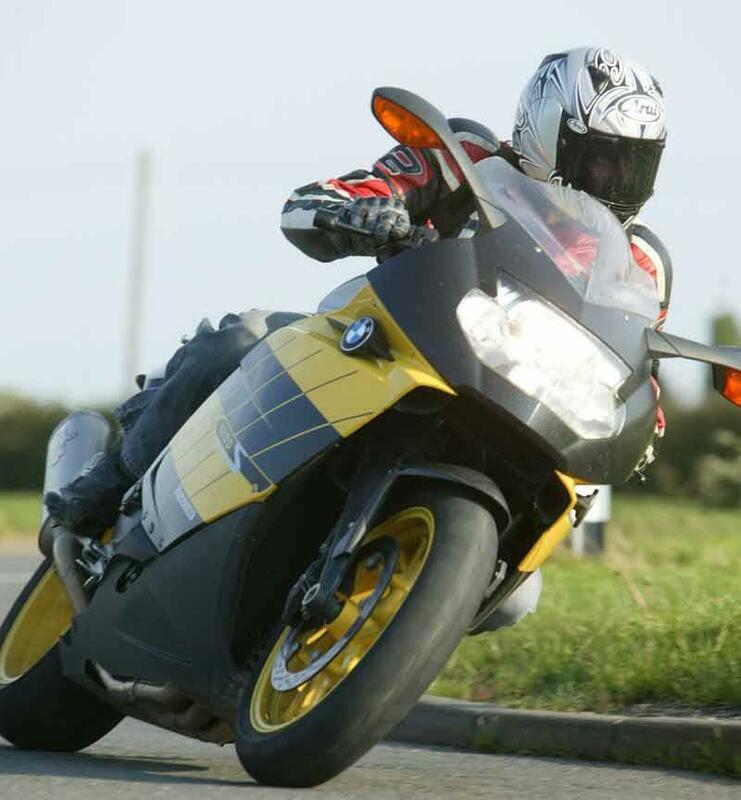 21 owners have reviewed their BMW K1200S (2004-2008) and rated it in a number of areas. Read what they have to say and what they like and dislike about the bike below. BMW, second hand market needs reliable bikes, reasonable to run and cheap to fix when older, punters get wise to the companies who only want to sell new stuff with no back up or support ,(exhaust header obsolete part , that’s poor on a bike last made in 2009)? don't throw away a good reputation , your marque is renowned for older reliable bikes . Keep it. Electrics are weak point.... coils, Ecu etc get tired and cost a lot , mileage does wear stuff out for sure , but age also effects this type of equipment , wonder if low milage older bikes are showing same symptoms ? Coil failure is not uncommon by all accounts so replacing all is good advice. When running well though , it’s a good power unit , it tears through the gears and you have to think quick to keep up with it , fuel consumption improved as well when coils done , getting much better Mpg now. See write up on repairs in value and running costs , broke down regularly through year and prevented me from using it , long lead time at Motoradd dealers to get it fixed and some parts no longer made like exhaust headers , dealers are charming and knowledable , but are not cheap and ECU for example can only be sorted by them. Reliability issues on older models with expensive bills. Not got to end of year yet without break down ! Let's see what the next few months bring , hopefully the repairs will return a good reliable bike, if not, I will let you know how I get on. Take care if buying an older machine, the body work hides a multitude of issues that might catch you out. First ride out after purchasing the machine it had an ECU failure. Only a main dealer can exchange and fit a new one as the keys, immobiliser etc. all go through the unit (£1300). The dealer I bought the machine from paid for this repair. Next to go wrong were the coils (the next ride out after getting it back), two replacements required. Why did they fail? The exhaust header had split in the two into one section. Incorrect back-pressure and wrong readings to the ECU/mixture via the lambda sensor. Sadly, new exhaust headers are no longer in stock from BMW and there's no date for a replacement on the computer. I have resolved the issue, however,by sourcing a secondhand one from the USA (Texas weather = little corrosion). Come on BMW , support your older machines . This part has a reputation for weakness and good second hand ones are like hens teeth . Still a £900 bill in total ...... I had to pay out as the dealer I bought from is no longer in business. Expect to pay £ ... , lots of plastic to remove so labour charges will add up , BMW don't give their parts away, that's for sure and you will soon spend the value of the bike . Best advice : Buy from a main dealer and get a warranty , buy the newest model you can afford and check the history. Mines done 60k and is a 2005 model , it is one of the older bikes so maybe this is to be expected. Just unlucky this time or is this to be expected on a BMW of this age ? This is my first BMW and I bought it because of the reputation for quality and longetivity , maybe the maker is taking a different approach with the four cylinder models , this engine was their first four cylinder machine , the boxer twins seem to live for ever though and parts are available. Car Dealer who took bike in PX for a vehicle. Buzzy. But that's oddly also the upside. Around 4000 rpm the bike feels like its Begging to fly. Like a horse that wants to gallop. BMW bags are insanely overpriced. As is everything else by bmw. And the lack of space on the handlebars to put cell holders, etc etc means people have solved these problems themselves. Best bike ever, can't get the smile off my face. Super smooth and so much torque. Ride with a smile, its absolutely awesome. Great handling with fantastic comfort and looks. Super fast and smooth yet manageable power. Expensive parts when and if you need them. ESA (Electronic suspension adjustment). What a great little system for quick adjustments hassle free. Small dealer. Paid as advertised £4795 including sport panniers (Purchased Dec 2014) with free long distance delivery thrown in. Supplied with recent service, new MOT and good tyres and three month warranty. Badly designed, made and tested front steering. Life threatening fault never openly recognised by BMW. Front suspension and steering deveoped a life endangering fault after less than 10k miles. Great engine. Huge power. Nice feel and sound. Severe life threatening steering fault developed at very low mileage. Inexcusable. Riding sad since 1997, I had MZ125,Suzuki bandit, Z750S, CBR600F, GSXR1300R, CBR600RR, 2008 R1 and finaly 2006 model K1200S on May 2012. (-) POINTS: You have to inspect all electronics well if you buy a second hand. In some of 2005-2006 bikes there may be problems with ABS, transmission, engine and finaly tank guage. Engine, transmission and tank guage had changed under warranty on my BMW(and be sure these are really expensive) So ask if you think to buy of these elements conditions to he dealer. (+) POINTS It feels heavy first but after the wheels spin you feelp very lighter and nimble bike, even in heavy traffic. Engineering level and all paint&finish quality is #1. Cornering and high speed stability is amazing for such a big boy. You can scrap the pegs with a quality pair of tires. Acceleration is breath taking; up to 100 it is better than Busa(gen1), up to 280kmh similar to Hayabusa but over that speed you are seeking more power. Thanks God; mine can run up to 295 km/h(!) watch my video if you wish : http://www.youtube.com/watch?v=yXYyEVYyemY Fuel consumption is very pleasing with 5,5lt/100 km. Having a chance to be able to breake while cornering under urgent conditions with ABS make you feel really really confidence. Second hand selling may become an issue (as like as Hayabusa)But if you you want a reliable safe, fast and prestious second hand bike than this is K1200S; the best bike I have ever ride. Ride Safe, Be Safe ! Without a doubt the best bike I have owned. The engine is great, very flexible, relax and ride it on the torque or open it up to experience it's full capability of propelling you at stupid speeds. The handling is sure footed and reassuring at all speeds. I have seen as much as 160 miles to reserve and then it counts down from 50 miles. Once I had the reserve counter showing 2 miles to empty and I still managed to fit in only 15 - 16 litres in the 19 litre tank! Generally I found it very comfortable but occasionally got a numb bum on longer trips. However, my bike had it's fair share of problems. If cold the engine would rattle on start up for a second or two until oil got to the cam chain tensioner and if you tried to set off quickly the clutch would make a horrible squeal. Both faults were investigated but no faults were found and a lot of other owners on forums have had the same experience with no further problems, apparently sorted on the 06 onwards bikes. The only failures I had were the gearshift potentiometer, it is used to sense what gear you are in and display it amongst other things. But when it goes wrong you still get the gear indication because the bike works out your revs vs. speed and calculates it, though it won't sense neutral so causing starting issues but you can get round these until you get it in for a fix. The worst failure I had was the brake servo (removed on later models, only used to dampen the earlier models cruder ABS). I was enjoying a bit of spirited riding and the brake fail light started flashing at me, not good entering a 30mph zone approaching a 90 degree bend from a national speed limit. Luckily there was enough residual pressure to slow me down. The brakes still worked but didn't have the huge stopping capacity that I was used to (when they worked, they are the best brakes I’ve used) so I limped home. The fault went away but I took it to BMW who plugged it in, they said the failure had logged but not what had caused it, so away I went and it happened 6 weeks later again. Apart from these issues it was a superb bike and I regret changing for my RSV Factory (on some days). It was a do anything motorcycle, touring, scratching and commuting was a joy. Good handling for a big bike, suspension somtimes a bit choppy. Very disappointed with finish - rusty bolts, corrosion getting under paint on castings. If you use it in the winter beware! Dont believe what they say about depreciation, you'll lose more in £ notes than you would with a Jap. Clutch judder (had it replaced, still wasn't perfect). Poor fuelling compared to something like a 'Busa. Why do BMW persist in using 3 buttons for the indicators when everyone else gets away with one? How many times did I flash my left indicator at someone - the button is where the horn is on every other bike! All in all, the little flaws let down what could be a brilliant bike, expensive imperfection. Won't be buying another beemer. Usually change every year, first bike I have had (other than an RSV - but that was too painful!) that I can't see myself wanting to change for a number of years. Has its faults, clunky gearbox, vibes etc, but that is only when I compare it to others... without a comparison I wouldn't have mentioned it. Went around Spain and France on a 950 Adventure June 07, wish I had owned this then. Too expensive, despite loving it. BMW K1200S CRASH - ABS SERVO BRAKE FAILURE? As the title says, the K1200S is not perfect: the engine is a bit buzzy, the clutch can be finicky, the gearbox clunks, and there are some styling cues that don't quite work, such as the huge muffler can and the 1990's Hondaesque nose. However, the engine is a fizzing, bubbly thing that always wants to deliver great power and seriously storms when you get north of 6,000 rpm. The handling, while criticized by some as being slow in the steering and the Hossack frontend lacking feel, is absolutely planted and stays resolutely on line even when encountering a mid corner bump or the need to brake. Speaking of brakes, these things are foolproof and provide enormous power safely, all with the peace of mind of linked front-and-rear braking with ABS. Straight line stability is rock solid and unhampered by side winds and gusty days. Ride quality is excellent: compliant with good bump absorption, but without feeling cushy or soft. There is a little slack in the driveline, and this can be accentuated by the on-and-off fueling, but the maintenance-free shaft is great for weekend riders. And let's face it - we are the majority of motorcycle owners. The equipment is first class and the ESA is a must have option. The comfort for a sports bike is pretty good as well. For real life bumpy back roads there isn't a better sports bike out there, and for fast motorway cruising only the specialised tourers can beat it. The ESA is awesome; mine is mostly set on "sport" but for two-up cruising the "comfort" setting keeps the wife happy! Positive: Handling, brakes, stability, engine (it begs to be ridden hard), ESA (!!!). Negative: Gearbox (clunky) and poor on/off throttle transition fueling at 2500/3000 revs. My last bike was an Aprilia RSV1000R Factory and the K12S is just as exciting when ridden hard but way more practical and has alot better stability. On all but the tightest corners I am faster on the K12S because it gives me the confidence to improve my riding. I have had several different bikes over the years but this beats everything hands down! It does it all - tour comfortably, blitz 'A' roads, scratch on 'B'roads far better than a bike this size has any right to, and is so easy to use with its smooth power delivery and awesome torque! After owning the new K1200GT for 6 months before changing, I was expecting a notchy gearbox for the first few thousand miles, but this has no glitches at all and it goes up and down the box beautifully, with just a snick of the lever. The engine is just staggering - endless power that goes on and on for ever. The brakes are possibly the best on the market and the lights are excellent. Comfort is not quite as good as the GT but you can ride for hours without getting back ache - the bars are in just the right position and the wind protection is surprisingly good. The handling is truly excellent for a big bike. It is surprisingly flickable but what stands out is the planted feel you get when cornering - reminds me very much of the ZX7R I used to have. It really does feel as if it is on rails and totally unflappable. Are there weaknesses? Well, I cannot find any. Yes, it is expensive, but the build quality is second to none and you really do get refinement from BMW these days. For long distance touring you could do with a slightly bigger tank but that is being very fussy! The panniers are actually very good although their style is odd to start with - they do grow on you. This is an aweful lot of bike and it will surprise many people who have old-fashioned ideas about BMW - try one; you will be amazed! Bought new in 2005, 17,000miles and going from strenght to strenght! I bought the k12s in June 2005. The bike its fully loaded:esa(electronic sospention adjustment), abs, alarm, BMW paniers and gps system.I had a Honda CBR1000F for 10 years and decided I wanted a supersportourer, as the CBR was getting on a bit. I looked & testrode a few (Backbird, Triumph Sprint ST, Kawasaki 1200, and VFR), but when I looked at the K12's I loved the look, it only took a 2 hour test ride on it to make me part with around £12,000!!! I toured around Europe on it(Blackforest trip last year,and Loire castles trip this year....Alps next year!) and it's perfect for me for fast touring. The ergos are perfect as well (I'm 6 feet tall & put a double bubble screen on, which deflects the wind to the top of my helmet). Although the performance is the same as most 1000 sportsbikes, the riding position it not at all extreme and I can ride all day long with no aches and pains. I also use it to commute to & from work (90 miles round trip), and go out with friends at the week end.The k1200s does this perfectly. Strengths: This bike is a missile and it's alround ability its fantastic! I've found it reliable. 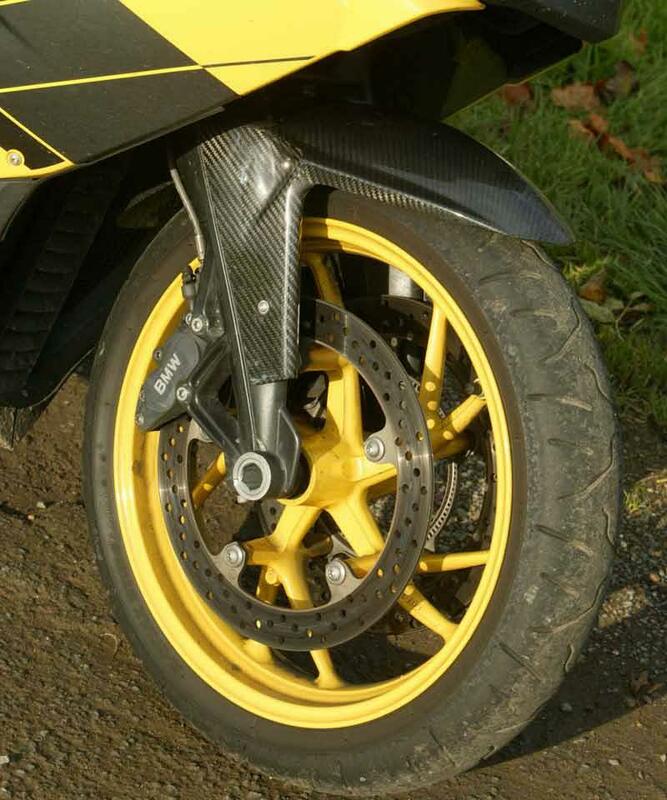 The brakes are the best on anything on 2 wheels,and the stability and handling are perfect. this bike is on it's own rail....pick a line & it will not move!! Weaknesses: Clunky 1-2-3 gear shift, slight fuelling glitch at betweeen 2/3k revs., goes too fast too easily. Watch out for points on your licence!!!! This bike is a dream come true!! I bought this bike a week ago and the dealer told me not to go above 6000rpm for the first 600 miles (which seems to be taking forever). However the power band starts from 2000rpm so you don't mind so much. This bike corners like it is on rails and the breaks are the best I've ever tried on any bike. Plus the seat and mirrors are fantastic. If you can afford it, this is the best bike around and all the bike you would ever need. Strengths: Engine, performance, handling, brakes, mirrors and seat are all of the highest quality. Weaknesses: Price tag mainly, but also other few little gripes. I wouldnt call them anything more than that. You need to have very close control with the clutch due to its power and yet the clutch is quite heavy so I'd suggest to test ride the bike in a city before you buy it. Also the gear change from 1-2 and 2-3 sound a bit clunky. But other than that, this bike is perfect. If you try one, you'll want to buy one ! I tried a lot of sports bikes and sports tourers before this bike. I think this has it all! Looks, handling, POWER, comfort (I am 6-3) I just absolutely love it! The ESA is just the trick, never noticed the shaft and this makes it so clean. I just can't say how much I love this bike.... and no, haven't found anything I don't like! Testers have column inches to fill, real-world, this is more than enough for 99% of riders. Strengths: Comfort, power, handling, looks. Weaknesses: Can't stay off it! Awesome sports tourer. Quality finish. Overall this bike has all the real world rideability that you could ever want/need. Sporty seated position but comfortable (similar to VFR), real power and torque. Ok, it's not a sport bike and does weigh a fair chunk, but on the road it all helps. Love the ESA, love the heated grips, BM alarm is easy to use. BM panniers are a clever bit of design, didn't like them at first but after a couple of trips I found that the hard shell/flexible size is a real bonus. Strengths: Brakes - awesome power. Engine very smooth, injection is much better than orignal pre-producation demo models of late 04. Shaft drive. ESA is great. Handling. Quality, quality, quality! Makes Jap' bikes look poorly finished, but then they are cheaper! Weaknesses: Gearbox, 1-3 very clunky, although dropping the height of the lever around 10mm from the factory setting makes a huge difference. Probably the shaft drive adding extra weight to the system. Decrease play of rear brake (from factory setting) to get real power from it. £12K new with ESA, ABS, Heated grips, alarm and panniers - but it is worth it. One off the best bikes on the market at the moment! Weaknesses: It does not like to be ridden too slowly, it prefers spirited gear changes. The price is in Malta Lira.